Mmmm there's no better warmup or supplement to a meal than a freshly baked baguette with butter or brie. Did you know that the baguette, and other narrow breads for that matter, were invented because their slender shape allows them to be rapidly prepared and baked, meaning they can be ready in time for dinner? Whether you're serving this treat to the customers at your restaurant, guests at your catering function, or your family during French supper night, you'll want to ensure that you're providing them with the appropriate vessel for the delicious baked treat. 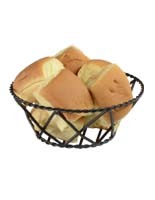 An oval, stainless steel basket, with a classy wire design, is a go-to for many restaurants. Their long, narrow shape is perfect for the submarine shape of a crisp, fresh baguette or flute bread. 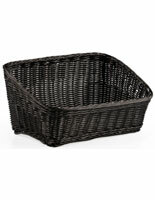 The black basket with a decorative design has an ornate design which complements even the fanciest table setting. 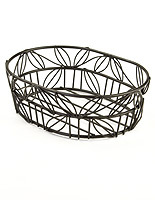 This steel baguette basket looks perfect besides a platter of pate, ghee, butter, jam or cheese to spread on top of the slices. 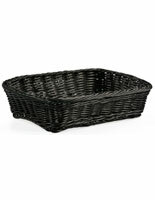 It's a cinch to clean the crumbs out of these baskets, but for a classy and cleaner look consider lining with a beautiful black napkin. 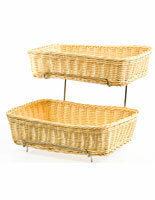 You may also want to go with a square baguette basket. 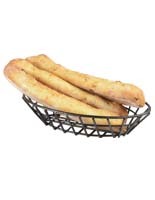 These large woven containers are perfect for holding a large quantity of baguettes and breadsticks due to their large shape and deep basin. Choose one that's food-grade with a plastic construction and is dishwasher safe. 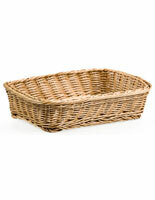 After dinner's over, simply wash the basket in the dishwasher along with the rest of the dishes if necessary. 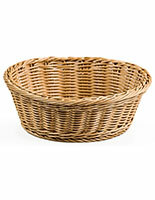 Also, don't worry about the polypropylene baskets becoming brittle over time. Their reinforced steel threads and sturdy construction means they can be reused for many family dinners for years to come. 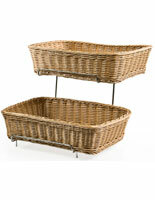 Choose from these bread baskets for the best way to serve your baguettes, but don't stop there. Displays2go sells a huge variety of restaurant merchandise and food displays. 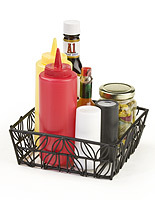 Shop around for affordable food service merchandise, and upgrade your home or restaurant today!